The hellbender (Cryptobranchus alleganiensis) is a native salamander in need of such help. 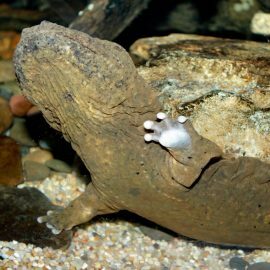 One of North America’s largest salamanders, the hellbender depends on clean, cool, fast-moving mountain streams and rivers for habitat. It is found in three distinct populations in the eastern United States: one in the southern Ozark Mountains (C. a. bishopi); one further east, primarily in the Appalachian Mountains (C. a. alleganiensis); and a third, relict population (C. a. alleganiensis) in the northern Ozarks. 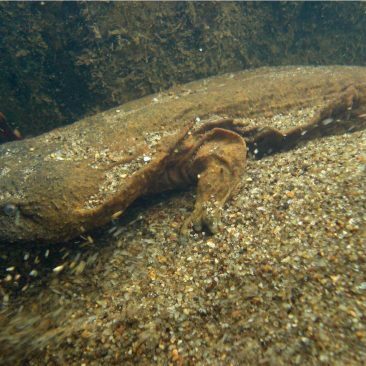 Hellbender research has shown steep declines—some as high as 77 percent—among a few hellbender populations. Researchers have not yet evaluated most hellbender populations. The Appalachian population in particular has received little scientific attention. This may be because many researchers think North Carolina’s hellbender population is stable. Unfortunately, there is not much in the way of scientific evidence for this belief. In fact, before our study began in 2007, no one had surveyed North Carolina’s hellbender populations. That situation changed when the Association of Zoos and Aquariums awarded a Conservation Endowment Fund Grant to the North Carolina Zoo. That grant funded hellbender research in the mountains of North Carolina. This research helped us begin to understand our native hellbender’s range and allowed us to start searching for environmental factors that may lead to hellbender abundance. Staff at the North Carolina Zoo worked with the North Carolina Wildlife Resources Commission to complete the research. We also recruited state and federal agency partners, university and environmental organization volunteers, and even a few eager citizen scientists to help us. Our teams conducted three field surveys in August 2007, ten field surveys between May and October 2008 and four more surveys between July and August of 2009. We also undertook an additional 2008 survey that visited two study sites to look exclusively for hellbender larvae. 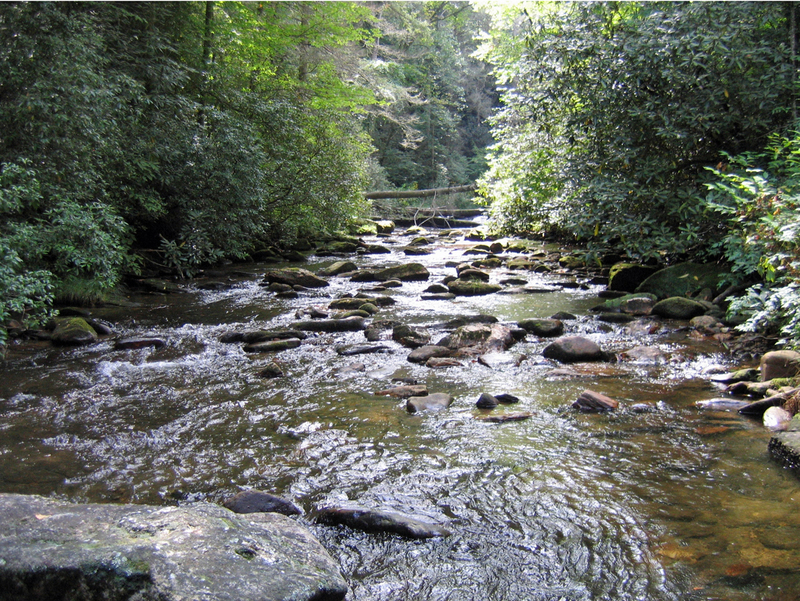 We selected study sites from each of the five river basins that are known to support hellbender populations inside North Carolina. We searched for and captured hellbenders living in the boulder-strewn, fast-moving waterways that hellbenders depend on. We weighed and measured each captured hellbender, took skin swab samples from it to test for the Chytrid fungus and released the animal back into its home stream. We also recorded several water quality measures at each study site. We surveyed 54 river sites. Thirty-two of those sites, according to historical records, had supported hellbenders in their waters; the other 22 sites were new. We found hellbender populations in 24 of these historical sites. On the other hand, hellbenders occurred in only nine of the 22 new locations we selected. hellbenders appear to be more common in North Carolina’s western mountain river basins than they are on the state’s eastern slopes. there was a negative correlation between hellbender numbers and human development. In other words, the rivers and streams away from human development (like roads and subdivisions) tended to support the largest hellbender populations. the distribution of ages and sexes among many of the hellbenders we found was normal. This means that there were reasonable numbers of young, middle-aged and old hellbenders, and that the ratio of male to female hellbenders was also reasonable. That in turn means that the population is managing to reproduce normally. Also good to see was that many of the hellbenders we found were younger animals, which again tells us that the population is reproducing well. however, we did not find any young hellbenders at several of our study sites. We found only a few, widely-spaced, older hellbenders at these sites. The lack of younger animals tells us that reproduction has probably been upset within these groups. because Chytrid fungus is a major problem for amphibians around the world, we took a skin swab from each hellbender in our study and had the sample analyzed for signs of the fungus. The tests showed low levels of Chytrid in a few of the hellbenders, but none of them exhibited any symptoms of illness. 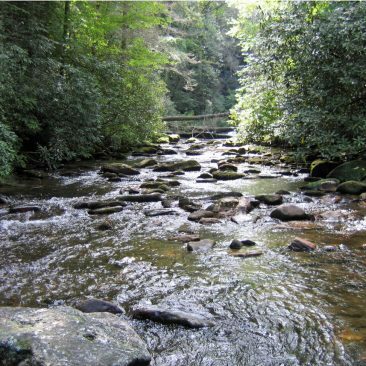 Our research provided supporting evidence for a decision to change the status of one of the rivers in the French Broad River drainage system. Previously, the river was ranked as “High Quality.” It is now ranked as “Outstanding Resource.” This gives the river, and the hellbenders in it, increased protection from developers and from cities wanting to do new construction or activities that could harm the river. 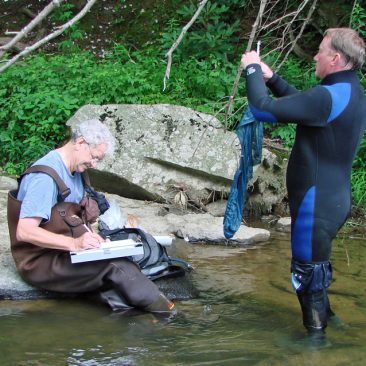 We will continue to use our research results as evidence to better protect other rivers in the North Carolina mountains.We also shared our data at two hellbender conservation meetings. One meeting held at the NC Zoo drew researchers from several state and federal agencies, as well as from several universities. 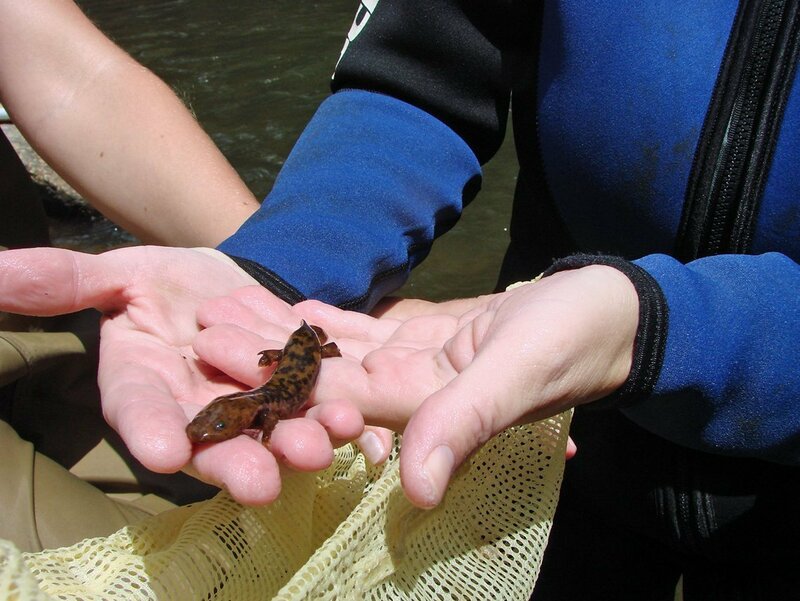 We developed a series of action plans describing the steps conservationists need to follow in order to protect the state’s hellbender populations. We also presented our research results at a Hellbender Symposium held in Corbin, Kentucky. As part of another outreach program, the NC Zoo Society funded 10 hellbender information signs that have been set out along North Carolina’s New River Drainage System. Developed by New River State Park personnel, the signs present some of our survey results and encourage hellbender conservation to people who use the waterway for recreation. Finally, one other outreach program includes “Snotty the Snot Otter,” a hellbender-costumed character designed and built by students at Randolph Community College in North Carolina. 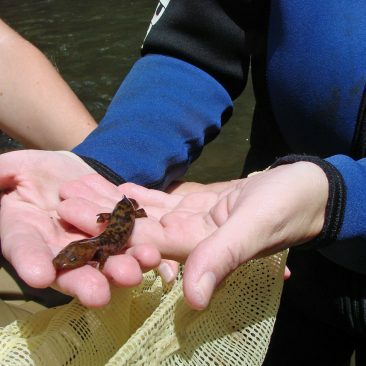 The character is part of program underway to teach children about hellbender conservation. 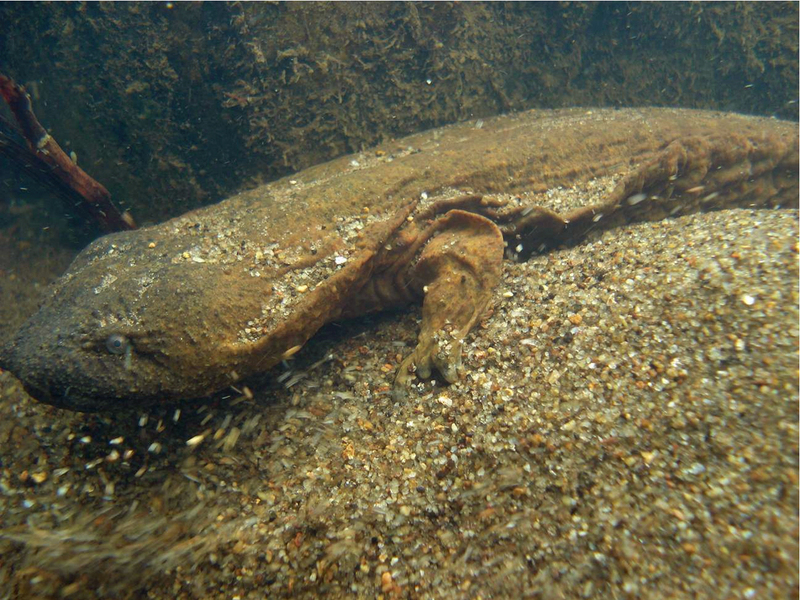 North Carolina has 3,000 mountain waterways that could support hellbender populations. We must survey many more sites before we can know where we can, and cannot, find this species. 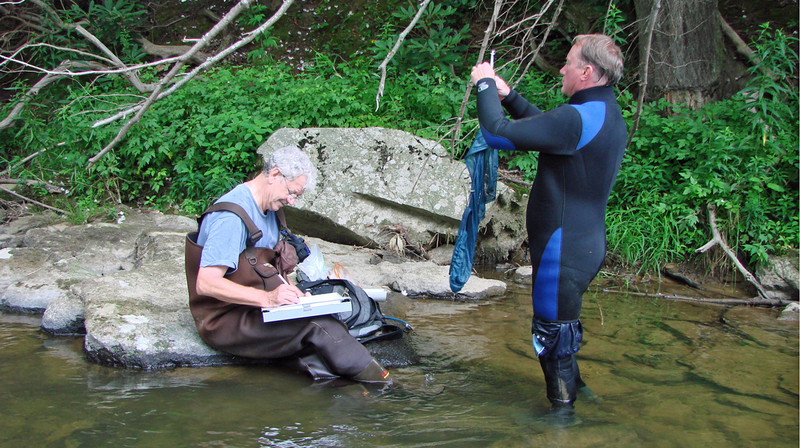 Future surveys will also help us understand the environmental variables that are affecting hellbender populations.